The Memorial Tablet commemorates members of the 26th Infantry Battalion who died in service or were killed in action during World War One. The Battalion was raised in April 1915 from Tasmanians and Queenslanders at Enoggera, Queensland, for service in World War One as part of the 1st Australian Imperial Force (1st AIF), and was attached to the 7th Brigade. The battalion fought at Gallipoli before being sent to France where it served in the trenches of the Western Front. 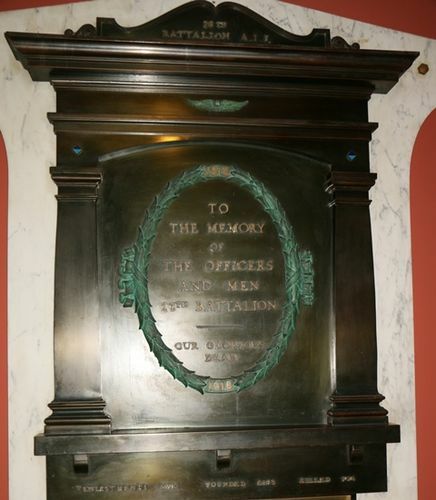 26th Battalion Plaque honours the fallen of the battalion during Word War One. The memorial tablet was unveiled by the Governor General, Lord Gowrie during a stopover in Brisbane on a cruise to Papua New Guinea in August 1937. The Courier-Mail (Brisbane), 6th August 1937.